115 permit requests have been handled by Jakarta Investment and One-Stop Integrated Service (PMPTSP) Dept. through Jakarta Evolution (JakEvo) application.
" Since JakEvo's Soft Launching on April 26, we have handled 115 permits"
Jakarta PMPTSP Dept. Head, Edy Junaedi said, the 115 permits have been requested by residents after his side tested JakEvo application a week ago. 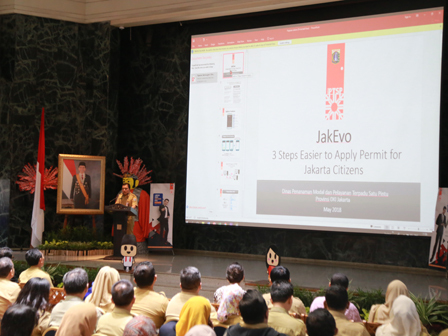 "Since JakEvo's Soft Launching on April 26, we have handled 115 permits," he stated at City Hall, Monday (5/7). He explained, those permits consist of 57 business permits (SIUP) and 58 registration certificates (TDP). All of them are from 25 Sub-districts in Jakarta. "Most permit applications are obtained from Cengkareng and Penjaringan sub-districts," he mentioned. With this ease of permit submission progress, he hopes Indonesia's rank in Ease of Doing Business Index (EODB) may increase. "Last year, World Bank was still recorded that we could handle permit in 14 weekdays. But by using JakEvo, we can handle it within 60 minutes," he said.